If you want to crochet a cold-weather hat for a special guy, this men's winter hat pattern is a great pattern for any crocheter. The hat is a classic style with a stitch that resembles a rib knit. But instead of knitting, this hat uses crochet. This hat is part of a coordinating set which also includes a winter scarf. If you've ever done any simple hand sewing or embroidery, you'll have no problem with the finishing required for this project. And if those are new to you, you can still figure this out with ease. The body of the hat starts with a rectangle, which you will use to create a tube shape. Then you gather the top of the tube with running stitch to close off the top of the hat. Crochet Hooks: Size K / 6.5 mm hook. Adjust the size if necessary to achieve the correct gauge. 4 sts = 1 inch; row gauge is not important. 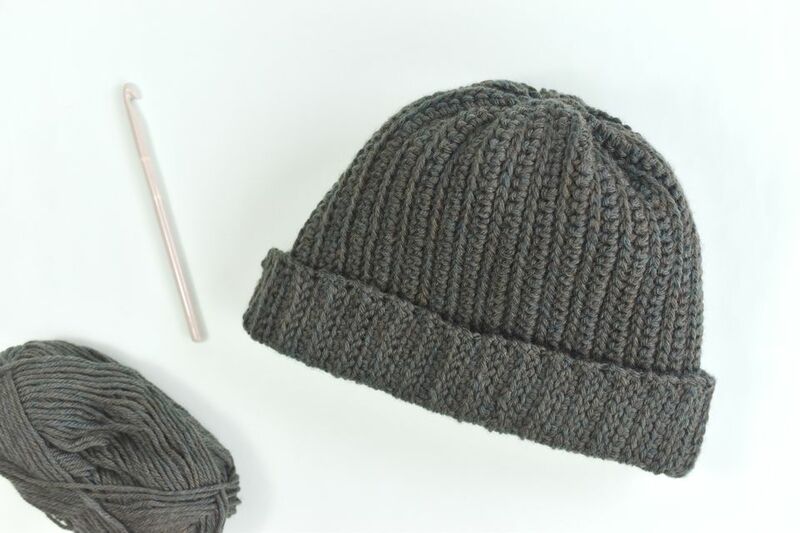 Be sure to make a gauge swatch before crocheting this hat. This pattern fits an adult male. It measures approximately 11" long and 22" in circumference around the lower edge; it measures 11" across when laid flat. If you'd like to make your hat longer than the sample, increase the number of chain stitches in your starting chain. To make your hat shorter, decrease the number of chains in your starting chain. If you'd like the hat to fit looser, crochet more rows. To make it fit tighter, crochet fewer rows. Rows 5 and Up: Repeat rows 1–4 with the following minor change: on the first row of slip stitch after a row of single crochet, work the sl sts into the front loops of the sc sts in the previous row. Continue working in pattern repeat until your hat is the desired size. A good gauge is to crochet 100 rows total, but you should crochet as many rows as necessary to achieve a comfortable fit for the intended wearer. You can do a quick fitting by using safety pins to pin up the sides of the hat and try it on. Hold the active loop in place with a stitch marker and leave the yarn attached to the skein. Weave in the remaining ends. Block and let dry. With the right sides together, hold or pin the first and last row together to form a tube. Using the yarn still attached to the skein, work one slip stitch through both loops of both the stitches in the first row and last row. Keep the hat turned wrong side out. Thread the yarn needle and hand stitch a loose running stitch all the way around the upper perimeter of the hat. Make the stitches as even as possible and near the edge. If the stitches are about 1" long, it makes it easier to close up the top of the hat. Pull the running stitch to gather the top of the hat. After pulling the gathers tight, make a few extra stitches to secure the gathers. Tie off the yarn. If you aren't able to get the gathers pulled tight enough, you can also crochet a small circle and stitch it in place to close it off. However, before you do that, try restitching the top with larger stitches to get a tighter gather. Turn the hat right side out and fold up the bottom brim.